DVD compressor is very useful when you need to reduce DVD size for saving memory space, playing on portable devices, or for burning to a blank disc and so on. There're many DVD compression programs, but many of them, for example, DVD Shrink, take even a few hours to finish compression task or output distorted file. Without further ado, we share the best DVD compressor for Mac (macOS Mojave) and Windows 10/8/7 and also the step-by-step guide to compress DVD to smaller size (50% or higher compression ratio) with highest quality in at least 5x faster speed than other free DVD compression tools. Best DVD/ISO Compressor to Shrink DVD/ISO Image Files Super Fast! Based on the most important factors - compression ratio, quality and speed, deciding which DVD reducing tool to choose, we tested many DVD shrinking software, ranging from free to paid, including free DVD compressor DVD Shrink, MacX DVD Ripper Pro, Amazon's DVD Shrinker, Nero Recode and more. 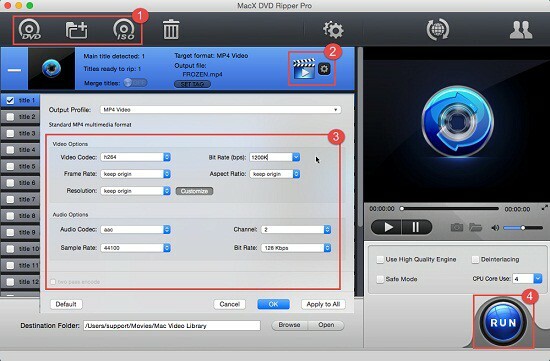 MacX DVD Ripper Pro nabbed No.1 spot. The best DVD compression software can help compress DVD, as well as compress ISO image to MP4, WMV, AVI, MPEG-4, etc smaller-sized file formats for burning to blank DVD, or playback on iPhone, iPad, PSP, Android mobiles, storing in storage devices with less space occupation or for quick uploading to YouTube or emailing. What's better, with the hyper-threading tech, QSV, multi-core CPU (up to 8) utility supported and High Quality Engine, you are allowed to apply this DVD yet ISO shrinker to accomplish DVD/ISO compression within mins (36X faster speed provided) with high quality. Original DVD can be shrinked down to 50% or less to fit in the blank disc size. Embedded High Quality Engine ensures superior quality output. QSV acceleration, HT tech, and multi-core utility make it the fastest DVD compressor. Auto crack DVD protection like Diseny DRM, Sony ARccOS, Region Code etc. Convert DVD to 370+ video audio codecs formats, with 420+ profiles for iPhone Android etc. No complicated parameters settings, easy to get started for any users. With optimized device presets, it is available to rip & compress DVD to iPhone, iPad, Android, Microsoft, Sony mobiles as well as other portable devices easily and directly with much smaller file size but nearly original quality. On top of compressiong DVD and ISO image to digital format with much smaller file size, what's worth a mention is that it also offers adjustable video/audio parameter settings for DVD compression, such as codec, bitrate, frame rate, resolution, sample rate, aspect ratio, audio channel, etc. if you think the output video format is still large. (this is a sound supplement). And all these settings are easy to deal with. It allows you to rip/decrypt copy-protected DVDs, no matter the new Disney copy-protected DVD or the general CSS encrypted DVDs, Sony ARccOS protected DVDs and all region-protected commercial DVDs. More importantly, this top DVD compressor provides constantly update so as to support the latest DVD copy protections. Before starting to compress DVDs, free download the fastest DVD compression software for Mac or for Windows, if you haven't downloaded it. To rip and compress DVD movies, here are three options for you: 1, directly insert the DVD disc to compress DVD disc; 2, load ISO image file to compress ISO file instead of the plastic DVD disc; 3, digital Video_TS folder can also be accepted as input format. Choose an output video format or device you'd like to compress the DVD to. H.264 MP4 is highly recommended thanks to its high compression rate, good video quality and wide compatibility. Step 3. Set parameters to compress DVD. Video format, resolution, bitrate and other related parameters determine the size of an output file. To get a smaller output file, you can make use of the compression options provided by this DVD compression software. * Lower the bitrate 20%-50% of the default. Bitrate is an important factor of video file size. You can lower the video audio bit rate to reach small files. * Change video resolution. 640 x 480 is a good option, because it is fit for iPhone, iPad, Android mobiles, Microsoft devices, and video website like YouTube, Facebook, Vimeo, etc. * Move the slidebar of LQ-HQ. You can adjust the slider to lower quality to get a small file, if you don't mind some artifacts in the final compression. * Compress the video by trimming. If you only need part of the video, just trim it and get a small video. This DVD compressor allows you to trim video by setting start time and end time. You can find the Trim option after clicking "Edit" button. Hit "RUN" and you can initiate the compression. Also learn tips on how to compress videos for DVD burning. 1. Insert your DVD5 disc into the drive, and then open finder. 2. Double click the disc to open its window, and drag the compressed DVD folder you want to burn to it. Arrange and rename the compressed DVD files. 3. Go to Choose File > Burn [disc] to start to compress and burn DVD to DVD. Tips: After you compress DVD movies from large size into smaller video with the above DVD compression software, you can move the compressed DVD movie to mobiles for freely playback. To simplify the video from Mac to iPhone process, you can turn to MacX MediaTrans, which will transfer videos, movies, music, ringtone and more from computer to iPhone iPad and vice versa in a flash. Notice: When you compress DVDs with copy protections, you should know that converting encrypted DVD is illegal in some countries. You may face legal consequence if you compress DVD contents for illegal purpose. Please abide by the local DVD copyright law before doing it.